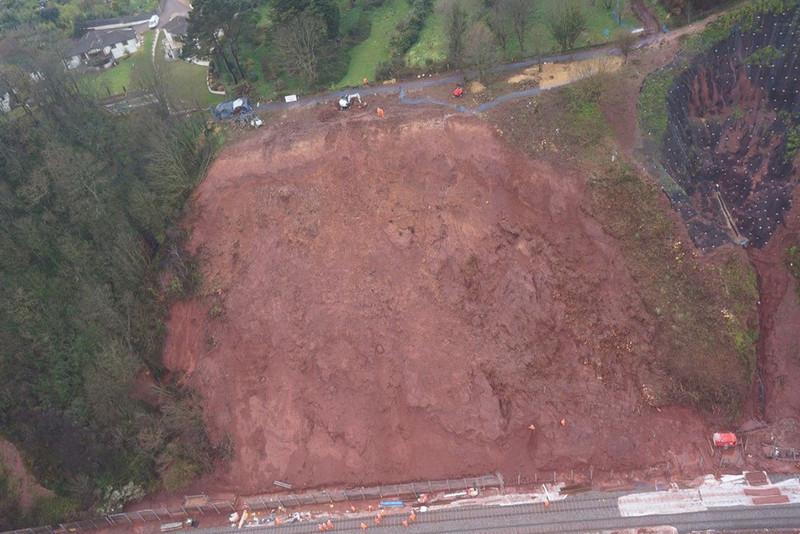 During a period of prolonged stormy weather, the mainline railway between Exeter to Dawlish was completely closed as a result of a major mudslide. Failure of the 40m high sea cliff lead to an active mudslide, whilst the slope above remained in a highly unstable state. CAN mobilised an emergency response team, with the initial aim to remove the least stable weathered breccia. Access for large plant was not feasible, due to the presence of houses along the crest, the railway at the toe and the height of the cliff. Early attempts to induce a slip using water jetting met with limited success. Thereafter CAN carried out extensive scaling and re-profiling by hand. 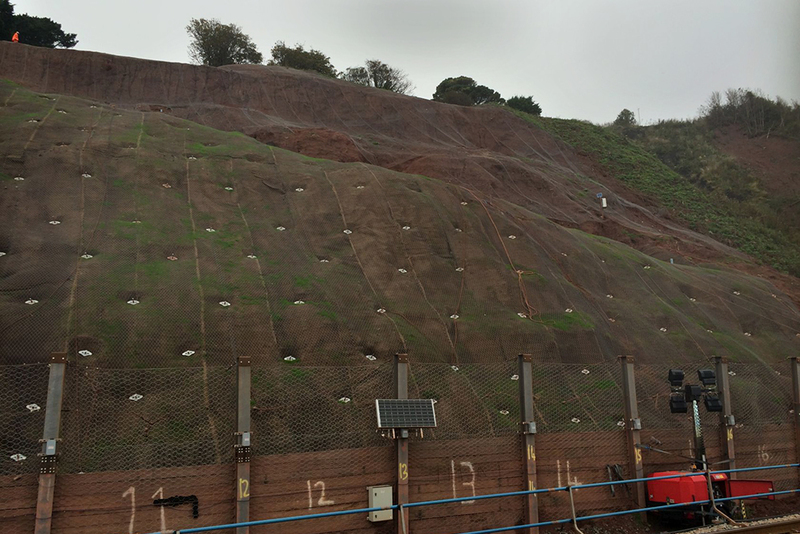 To minimise danger from falling material, the less stable lower slope was netted. Then localised strips of mesh temporarily folded back allowed safe removal of weathered material in a sequential manner. A-frame drill rigs were then mobilised onto the face to install soil nails. 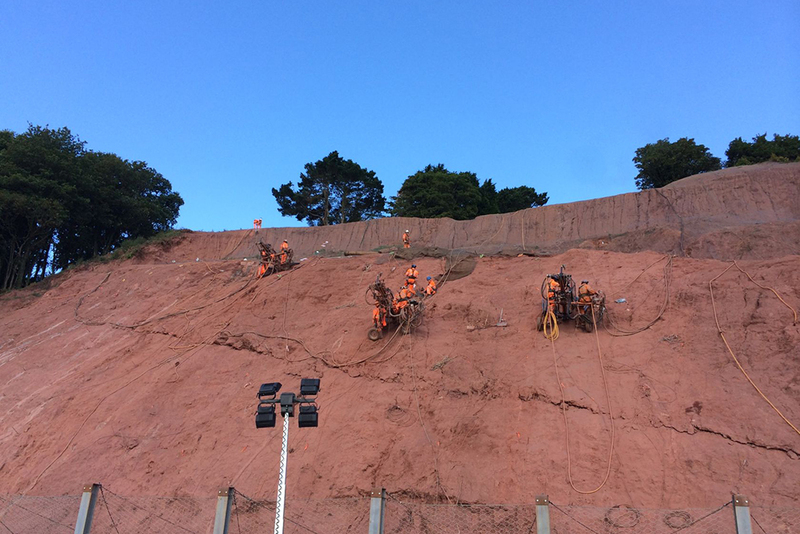 Operating 4 rigs at a time and with teams working round the clock on split shifts, over 400 soil nails up to 20m in length were installed over the slip area. Erosion control matting and high strength Tecco mesh were then installed over the entire face. Finally the slope was seeded with a mix of coastal grasses to promote re-vegetation. CAN then drilled vertical open boreholes to allow DATUM to install 12 shape array inclinometers over the face. This provided long term monitoring of further movements. 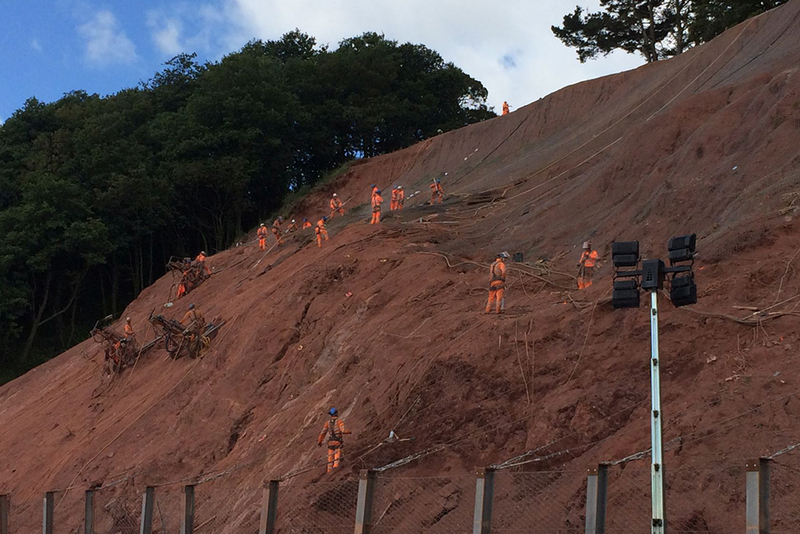 Whilst on site, ongoing repairs/maintenance also took place to the catch fence running along the toe of the slope which had borne the brunt of the initial mudslide.